The main goal of the publisher cooperating with an affiliate network is to get a сommission for his/her job. That’s why our interface is strongly customized for control and tracing of the сommission. Before the traffic redirected to the affiliate links is converted in real profit, it will be transformed many times. Thus, сommission tracing in an affiliate network is not an easy task, but we tried to make everything as simple as possible. Below you can find a figure that can serve as a reminder: where you can find a сommission before it’s converted into real money in your wallet. Start from searching the Statistics, here you can see all clicks on your links. Each click is the potential earning, so additional control will be quite useful. To get the latest information use the Real Time Report. When a conversion occurs at the side of the advertiser, our system displays it as open leads or targets. In the Statistics you can trace the development of clicks→leads→actions, but before the advertiser confirms the target there’s no сommission as such. In the Statistics (e.g. in reports on Offers) 1 will be added to the targets counter. In Statistics (e.g. in reports on Offers) the approved сommission will be added to the total сommission of the publisher. If the advertiser uploads data only once per month, then accrual on the internal account of the publisher will also happen monthly. In parallel to the Statistics the following section will be updated too: Office | Finance and payments | Operations history. All accruals on the internal account of the publisher from the moment of registrations are accumulated here. All operations are grouped per days, so the сommission will be displayed for the day of the registration in our system. Basically, the money is now earned, but the payment to the external account of the publisher will require certain time. During this period money will be transferred from the advertiser to our system (Payment time). Then the traffic inspection for cleanliness will happen (System Hold). 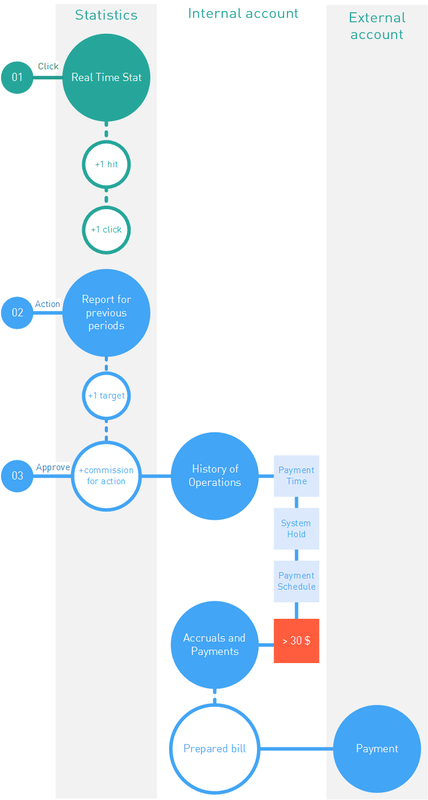 If the inspection is successful, then on the next scheduled date of payment the сommissions will be paid from the system to the main external account of the publisher. Please note that for the payment to be executed to the total amount of the сommissions shall exceed the minimum amount. According to the payments schedule in section Office | Finance and payments | Accruals and payments the new payment will be performed. When in Office | Finance and payments | Accruals and payments the payment пstatus will be paid, you can check the balance of your main external account.